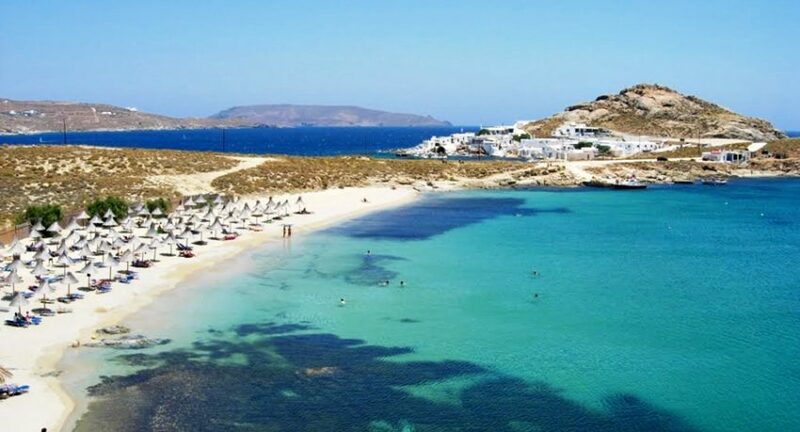 Agia Anna beach is a small but beautiful beach on the northeast side of Mykonos island, just before Kalafatis beach. It has fine sand and pebbles, crystal clear turquoise waters and is very quiet, like a sandy paradise, ideal for those who don’t like crowds and this is the reason local people prefer it. It’s the right place to enjoy your swim away from the noise and the overcrowding places that has the island during the summer months. A true shelter of serenity. This beach has the advantage that when in all the other beaches the wind prevents you from enjoy your swim, there the sea is calm. There are sunbeds and umbrellas but only those which are necessary, a small court for beach volley and a small shop with refreshments and sunscreens, as well as a bar with breakfasts and coffees, playing great music at the right volume in order not to spoil the tranquility of the beach. At the beach there is also a diving school where you can take diving lessons and take part in an underwater exploratory trips. If you get hungry, there are some taverns serving recipes from Greek and international cuisine, and a quaint restaurant between the rocks in a very romantic and idyllic scenery. There is a hotel there, that has a beach bar with very good facilities and beach service offering coffee, snacks and cocktails with fresh fruits. Across the beach, in a very short distance, is Divounia, a small bay with sand and gravel, like the picturesque fishing villages that we see in the movies, which is also used as a fishing port. There you can eat fresh fish and seafood in the traditional fish tavern. Access to Agia Anna beach is very easy, with the same bus that goes to Kalafatis or with your own vehicle.